Mom, the Intern: Flying kites. Yesterday was another rare day of perfect late April weather (we're normally suffering through the upper '90's - low 100's by now). I took the kids to the park in the morning and we met up with a bunch of other moms (and a dad!) and their kids for a play date. It was seriously blissful. The wind was blowing, the air was cool, the kids were (mostly) happy. I almost didn't go because I was so sure I'd have to chase Smush up and down the playground and intercept rocks from his mouth, but I was wrong! He played happily in the sand with the rest of the kids, and I got to enjoy some much needed adult conversation. 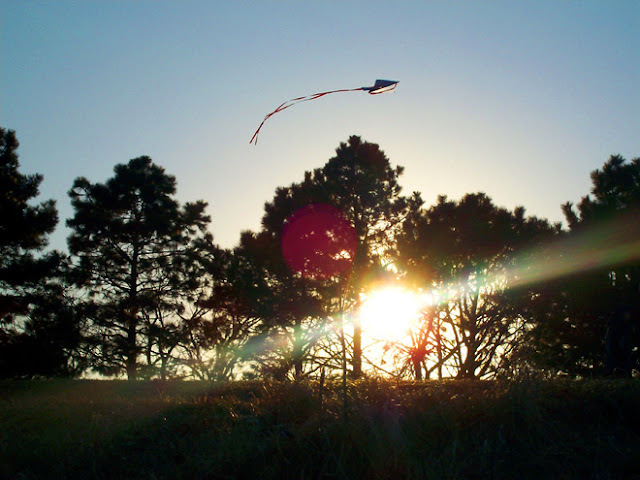 The day was so perfect, I decided that Dill and I should take the kids back to the park to do a little kite flying after dinner. The wind was whipping around quite a bit by that point, but we rarely even get a slight breeze here so we took advantage of it. Everything was going perfectly -- Bubby and Dill ran through the grass, throwing the kite into the wind and watching it dive and zoom around. Smush and I sat on the sidelines in the prickly Bermuda grass, watching intently. Smush wasn't trying to crawl or eat leaves -- he was just happy and calm. I soaked it all up. I was living a perfect moment. Then, the scene suddenly turned tragic. Bubby was gradually drifting toward the perimeter of the park, which is lined by mature trees. We noticed the kite was swirling dangerously close to a particularly tall tree. I yelled, "Run the other way!" and motioned away from the edge of the park, but she didn't understand. It was too late. Sure enough, the string twisted around the highest branch; the kite fought to break free. I yanked hard on the string in an effort to pull the kite down, but to no avail -- the string snapped, unforgiving. Bubby was sure that Grammy, or Daddy, or Amber's mommy -- SOMEONE -- could fix the kite, could retrieve it from the tippy-tip-top of the tree and bring it back to safety. But we sadly assured her it was stuck for good. She cried the whole way home. I cried inside. When you're little, events like this, which are mildly disappointing to adults, are heartbreaking. Little children can't see the big picture. They don't understand that the kite only cost $1.00 and can easily be replaced. They don't realize that kites get stuck in trees all the time; it happens to the best of people. When you're little, a kite is not just a kite. It's pure joy, it's excitement, it's achievement. It's magical; it's a toy that can fly. So when it becomes tangled in a tree and you are forced to abandon it, it's not just a minor misfortune like it is for adults. It's pure tragedy. It's the end of the world. The kite incident caused me to think about how we, as adults, are really just children -- God's children -- running around on Earth, losing kites. We struggle to make ends meet. We lose our jobs. We suffer illness and disease. We watch our loved ones endure hardship. And perhaps the saddest of all, we sometimes have to put our loved ones in the grave. And when these things happen, we feel the same acute sorrow in our hearts that Bubby felt when her kite got stuck. It's just as real. But even though God, our model Parent, sees the big picture and knows every tragedy can be overcome through Jesus Christ, He doesn't discount our suffering. He cries with us and comforts us as we mourn our losses, no matter how trivial. I'm starting to see the seemingly insignificant challenges I faced as a child have prepared me for the ones I've encountered as an adult. The pain we felt then -- when our pet fish died or when our ice cream cone toppled to the ground -- is the same pain we feel now when worse things occur. None of us are strangers to that knife-through-the-heart feeling, but when did we originally feel it? As children, when our happiness first took a sudden turn towards grief. As I realized this, I committed myself to being the kind of parent who comforts her sad children instead of minimizing their pain or expecting them to just "get over it." Sorrow is sorrow. It knows no age. And it hurts, no matter what. I once read an astute musing on suffering: If everyone was allowed to put their trials into one big pile and take out different ones, we'd all race to grab our own back out. Everyone has challenges in life; it's part of the deal. Sadly, we often assume those who are suffering are being overly sensitive or blowing things out of proportion. But who are we to judge the severity of another's afflictions? We should comfort, sympathize and mourn with our hurting brothers and sisters, not seek to undermine their pain or question their sincerity. Instead of wondering if someone's pain is justified, help them rise above it. Lighten their load; don't add to it. Today is the last day of challenge #1. Did you find someone whose spirits needed lifting? I did. It was an amazing experience. I listened to my heart and found a person who needed to know another cared. It was no big act; just a little thing to convey my concern. But it's the little things that make a difference. Thank you for this. What a wonderful perspective... I often lack on the sympathy- I am going to remember this. Good post. I need to remind myself to be sympathetic more often for my kids' small disappointments and sorrows. I am late but I'm still going to do challenge #1. I have a plan. Loved this. Great insights, Jenna. I really like that statement about putting our trials in a pile but reaching to get our own back. It's so true. Thank you for your thoughts.